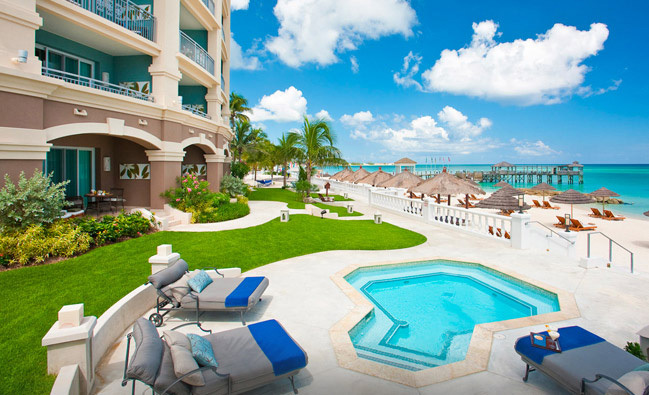 Sandals Resorts offers the Caribbean's most innovative and luxurious accommodations. 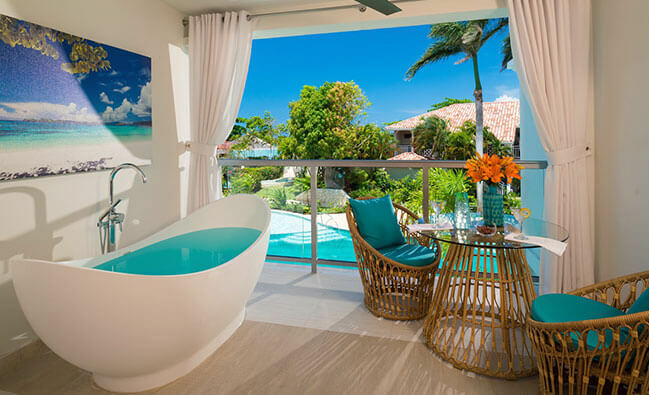 Elevate your romance to new heights in the Caribbean's most innovative, luxurious and opulent suites. 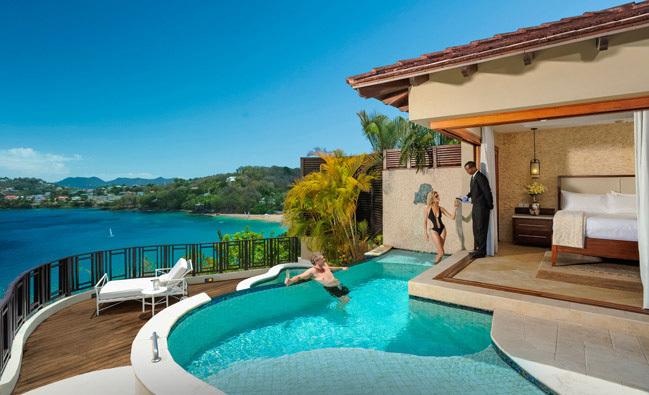 From dramatic cliffside villas with spectacular 180-degree ocean views to lavish Skypool Butler Suites with infinity-edge plunge pools that blur the line between ocean and sky, Sandals Luxury Suite Collection is unparalleled. The Caribbean's first overwater suites are changing the all–inclusive game. Hovering above turquoise seas, these innovative accommodations feature see–through glass floors for ocean viewing, a Tranquility Soaking Tub, an over–the–water hammock for two, a private infinity pool and personalized butler service. 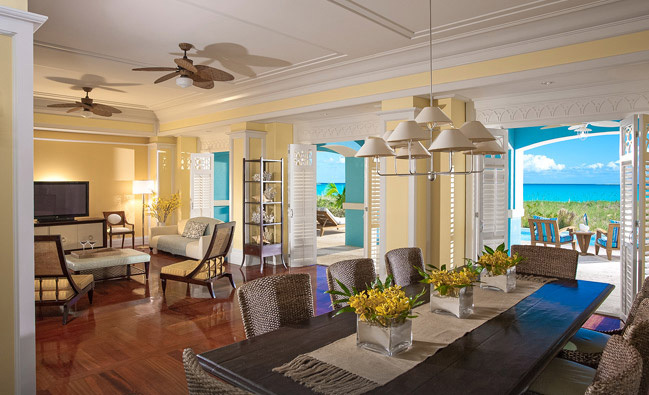 Combining indoor refinement and outdoor glamour, these suites are the epitome of Sandals luxury. 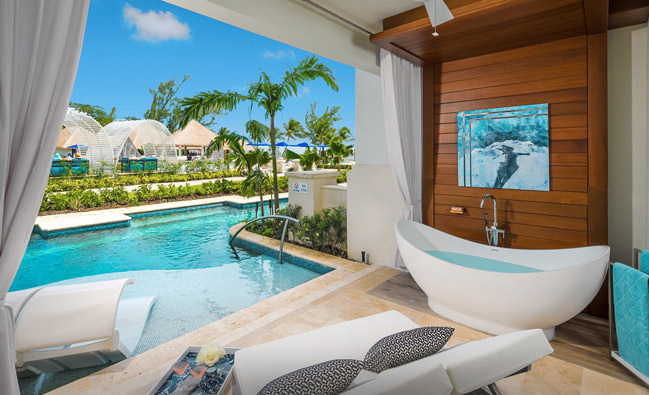 The Millionaire Suites at Sandals St. Lucia are set at the resort's summit, each boasting a 180–degree view of the island's best ocean views and featuring a zero–entry plunge pool with waterfall and whirlpool. 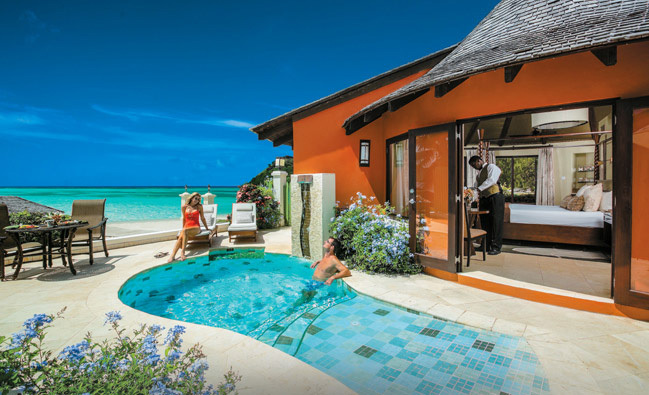 The Millionaire Suites at Sandals Negril offer secluded luxury including a private patio with a pool. Romance soars to new heights in our SkyPool Suites. 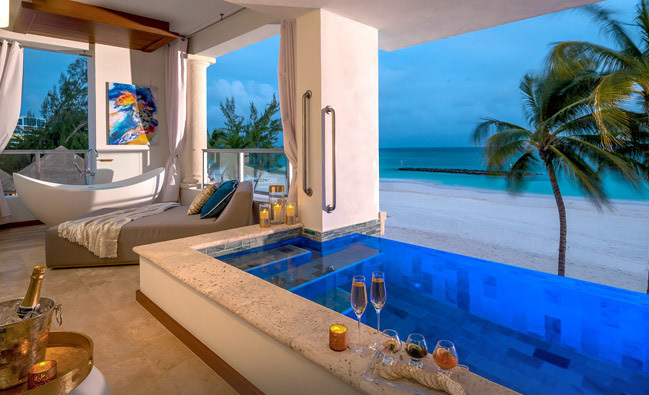 Open your bedroom doors to reveal an infinity plunge pool that seamlessly blends with the distant horizon. Glass mosaic tiling mimics the sky, while the surrounding coral stone brings it all back down to earth. Or step from your living room onto a terrace where a Tranquility Soaking Tub provides a delightfully surprising romantic diversion. Perched at water's edge, the beachfront Rondovals are imbued with a Zen–like ambience encircled by astonishing natural beauty. Just steps from the beach – and some right on it – these luxurious suites are the perfect retreats for celebrating love that's eternal. Epitomizing luxury and romance, the exotic Rondovals, our suites–in–the–round, surround you in modern luxury and tropical tranquility. 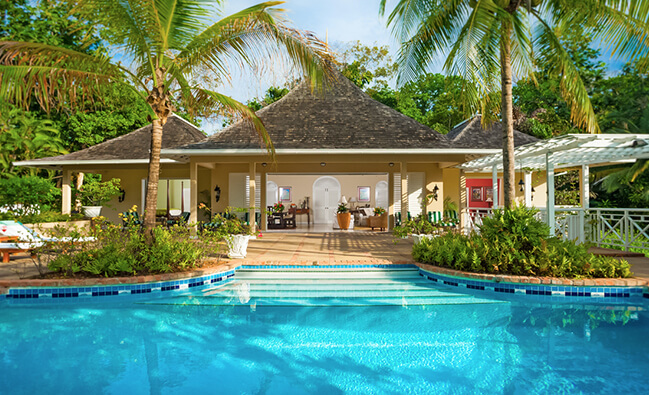 Steps away from the beach, tucked into hidden gardens, these romantic retreats feature 20' conical ceilings, intimate garden patios, private pools, mahogany furnishings, and personal butler service. Uniquely intimate retreats offering the ultimate in privacy where you and your loved one can share unforgettable intimate moments. When you are located on the best beaches, along the most beautiful stretches of ocean, it seems only natural to create suites that take advantage of the spectacular views. 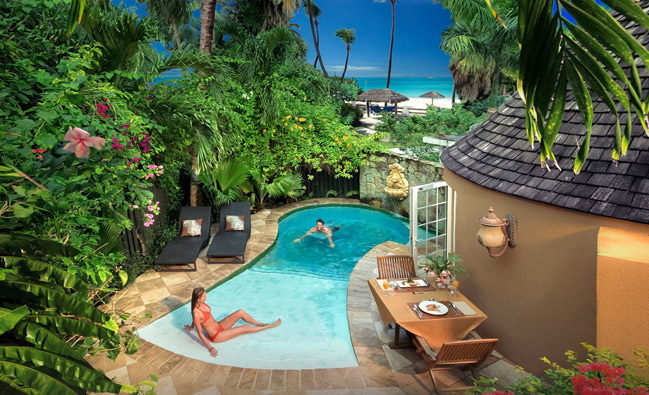 Inspired by the Caribbean, our plunge pool suites are true standalone retreats that offer an intimate poolfront piazza draped in sumptuous details such as king-sized four poster canopied beds and separate living rooms while opening out to tropical delights amidst the private deck including a plunge pool and whirlpool. 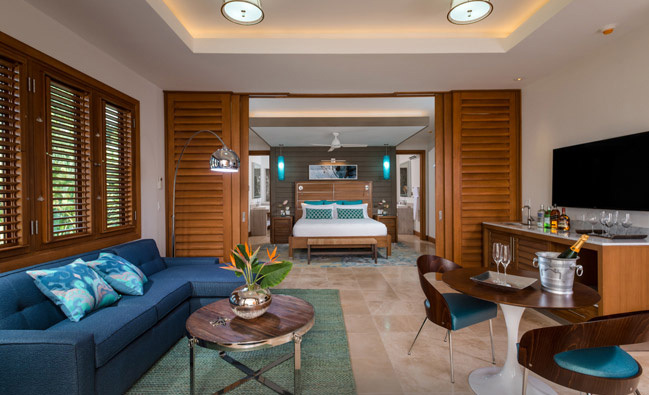 They're some of the most unique suites in the Caribbean: two–story lofts where a heavenly bedroom, complete with custom furniture overlooks an expansive living room below. 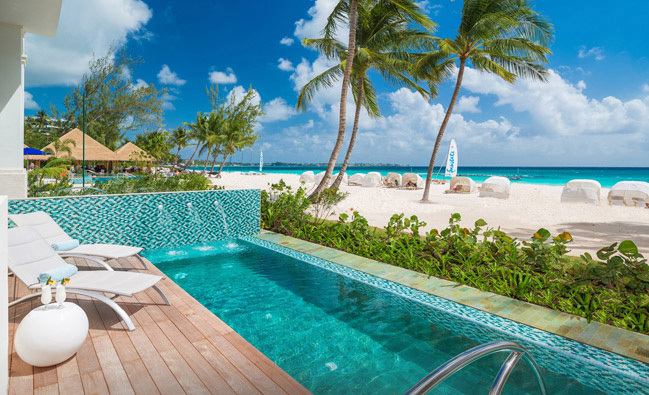 These dramatic escapes overlook the shimmering oasis of the crystal lagoon pool and many feature our signature Tranquility Soaking Tubs™ for two. Enjoy all the indulgences of a villa from the comfort of your sumptuous suite. Featuring luxurious amenities such as a king–size bed, elegant furnishings, spa–style bathrooms, and more. More than just rooms and suites, our Love Nest® Suites are luxurious retreats made for two people in love. No matter where you find them – right on the beach, over the water, high on a clifftop, hidden in a botanical garden, at the edge of a flowing pool – you'll enjoy a level of romantic luxury unlike anything else you've experienced.